My parents always told me, and I’m sure yours probably did too, that if something seems to good to be true, then it probably is. This was my first impression when I was first introduced to online penny auctions (I was sent a link to skoreit.com). I saw gift cards, precious metals, TV’s, Ipads and cameras being sold at crazy low prices, literally pennies on the dollar. I did some research and quickly figured out how penny auctions work. I put together this penny auction guide to explain the basics and the underlying principles that everyone who bids on a penny auction should understand before placing their first bid. It is important to understand that Penny auction sites are in the business of selling bids, not selling products. 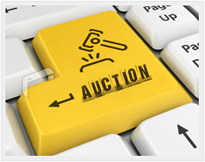 The auction sites themselves are designed to get you to purchase bids, that is why a lot of people consider these type of sites bidding sites and not auctions in their traditional sense. This is important to understand if you want to win penny auctions! I also quickly learned some common penny auction mistakes to avoid and eventually started detailing winning penny auction strategy by watching what and how the winning bidders spent their bids trying to win auctions. Penny auction sites list items for auction starting at $0.01 and a count down timer. Each time someone bids on the item, the items price is increased by one penny and 5-10 seconds are added to the count down timer. When the count down timer reaches zero the auction ends. The last person to bid wins the opportunity to purchase the item at it’s auctioned price off price (usually a huge savings). You win if you are the last bidder and the clock reaches zero. To bid on an auction, you must purchase bids. Bids usually cost between $0.50 and $1 per bid. Your goal is to win an auction spending as few bids as possible. All players have a limited number of bids in your “bid-bank”. You can buy more at any time but we use limited because bids cost money and everyone has a budget or a credit limit. You find an auction for a product you like. You bid on an auction. Each time you bid it spends one of the bids in your bid bank. The money you spent on the bid is gone as soon as you bid on an auction. Each time you bid there are 5-10 seconds added to the countdown timer of the auction and the price of the auction goes up by 1 penny (typically). To win the auction you have to be the last person to place a bid and the auction timer has to count down all the way to zero. If you are the last person to bid on an item you win and can then buy the item at it’s auctioned price. This is often 90+% savings. If you run out of bids and do not purchase more your auction is over if someone outbids you. You do not get your money back for any bids spent, regardless of whether you win or lose the auction. You can lose money on penny auctions, but you can also win incredible deals. Online penny auctions are a game. A competitive game. Penny auctions are totally different than ebay and other traditional auctions. You have to pay to bid on auctions. If you do not win an auction you still lose any bids you placed trying to win the auction. If you place a bid in an auction you are spending money. An item with an auction price of $1.00 means that 100 bids have been placed on this auction. You still pay money even if you do not win an item that you have bid on. It costs you money each and every time you place a bid regardless of whether or not you win. There are winning penny auction strategies that can help you win more and lose less. Regardless of whether you win or lose the auction, you are paying to bid. You are essentially buying a chance that the timer will reach zero without anyone else out bidding you. Penny auction sites are in the business of selling bids! They hope that the cumulative amount of money spent on bids used in a particular auction exceeds their cost of the item they are auctioning. The auction sites care about how many bids were spent. The amount the product sold for is an after thought. Penny auction sites make their money by selling bids. The truth of the matter is that any good penny auction site should make a profit! If everyone was able to spend a few bids and get hundreds of dollars of value in return for just a few bids then penny auction sites would not be in business. For example, lets say a TV with a retail price of $2000 is sold on beezid.com for an ending auction price of $100. At the price increasing by $0.01 for each bid placed an auction ending at $100 took 10,000 bids. Ten thousand pennies equals $100 dollars. Now where the online penny auction site makes their money is by charging sixty cents per bid. 10k bids at $0.60 each = $6,000 worth of bids. If the TV they sold cost them $2000 and they auctioned it for $6,000 worth of bids then they made roughly $4000 on this auction. That’s the business model in it’s simplistic form but it is important to understand that the penny auction site is in business to sell as many bids as possible. When they have the big win like this it is often offset by other times when that same $2000 TV is sold for a few hundred bids or less, which does happen as well. We could argue that the sites want a percentage of their products to go super cheap, it’s fantastic marketing to have users drooling over that $2.50 IPAD or a 42” flat screen TV that someone won for under $5.00. To be fair, there are more expenses that auction sites incur like marketing, support, and standard business costs but for quick math, the amount of bids spent on each auction is where the sites make their money, and this is how it works in a nutshell. Penny auctions are a competitive game. Understand this first and foremost. This is not discount shopping or entertainment shopping. We see people call penny auctions entertainment shopping or competitive shopping. Penny auctions in their truest form are a competitive game. Similar to poker. And penny auctions are a lot of fun. If you already play poker then you are probably going to love penny auctions! Plus, I think if you are already used to playing psychological games that reward cut-throat aggression then you are going to have a big leg up on the average penny auction bidder. Poker players are used to playing aggressively, using psychology, understanding it’s you vs everyone else and you have to do what it takes to win. Plus, knowing when to bluff when the time is right never hurts either! A lot of the skill it takes to be a winning poker player translate over to penny auctions and if you play poker already then you will probably really enjoy online penny auctions. You can look closer at penny auctions and poker in our game comparison. You can win penny auctions but it is not easy and there are no fool proof strategies that win every time. Anyone who tells you otherwise is lying. That is why it is important to learn the basics of penny auctions and have some sort of strategy or penny bidding style before you begin. You can not control other people and stop them from bidding if they choose to do so. But what you can do is utilize a sound penny auction strategy that will maximize your chances of winning. Becoming a winning penny auction player is possible. We have a growing collection of tips and strategy articles that show you how to win penny auctions, or at least the strategies we have used to win penny auctions in the past. We also collect and list links and information on the top penny auction strategies to win more and spend less. Take a few minutes to read through our penny auction strategy articles and learn tips and techniques to help you win more penny auctions online.